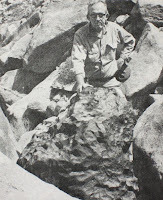 The second largest meteorite found in the United States was recovered from the Mojave Desert by a U.S. Marine Corps helicopter on June 17, 1977. It was found perched on the west side of Old Woman Mountain between Scanlon Gulch and Brown’s Wash about 40 miles west of Needles, California. Following the discovery, a politically charged legal battle ensued that lasted for a number of years. The participants included: the three miners who discovered the rock while searching for a lost Spanish gold mine; the Smithsonian Institute, the repository for significant artifacts found on U.S. government land; UCLA representing the State of California; and the San Bernardino County Board of Supervisors claiming title for the County Museum. The three miners located the 6,000 pound meteorite in the spring of 1975 and filed a mining claim to secure ownership under federal mining law. They then faced the practical problem of bringing it down off the mountain and finding a buyer. For some reason, that I have not been able to determine, they contacted the Smithsonian Institute and agreed to lead them to the site. Well guess what? After the visit and a determination that this particular find is one of largest and rarest specimens ever found, the three miners were informed that the Smithsonian was claiming title to the meteorite on behalf of the U.S. government. They gave the following reasons for their action: a) it is the property of the federal government if proven to be located on federal land, because it is subject to the 1904 Antiquities Act, and b) it does not qualify as “valuable mineral” as defined under the 1872 Mining Law. In other words, a large nickel/iron hunk of matter comes from some where else and is, therefore, not a mineral that can be claimed through discovery. The stunned miners were told that the Smithsonian typically negotiates a “finders fee” with those who find meteorites on federal land. UCLA’s claim was based on their having the most extensive collection of meteorites in the state. Politicians representing the county pressured to have it remain in San Bernardino County and displayed at the County Museum located in Redlands. The Bureau of Land Management, after determining that federal land was involved, maintained possession pending final determination by the courts. During this period, over 12,000 people visited the BLM office to see the Old Woman meteorite. In the law suit brought by the parties, Federal Judge Whelan of the U.S.6th District Court in Los Angeles determined that the meteorite belonged to the federal government; that the Smithsonian Institute would take possession for the purpose of scientific evaluation and provide specimens to other institutions including UCLA; and, finally, that the meteorite would be returned permanently to BLM in California for viewing by the public. His ruling included a provision that the Smithsonian would publish its findings upon completion of analysis. To my knowledge nothing was ever published. I don’t know if the miners ever got a finders fee out of the deal. I do know that there’s a lesson here for us desert folks: If you find a meteorite in a similar situation, on federal land, I suggest that you send a photograph of your find (in situ) to the Smithsonian Institute and get a firm agreement on a finders fee before divulging its location. At the time, I was an interested observer of all this. I guess what bothered me most was the caviler attitude that the agencies, scientists and the courts expressed toward the three miners. Incidentally, the Antiquities Act was established in 1904 to protect human artifacts found on federal land not items from outer space. The Old Woman Meteorite is currently on display at the Desert Discovery Center located at 831 Barstow Road, Barstow, California. Drop by sometime when you’re up that way. Up close, it’s quite impressive.